Those certain topics for me are blogging and health information. Titles like “I made $5000 dollars a month my first year of blogging” make me feel as if I have failed and failed badly. Then I remind myself that nothing can make me feel like a failure unless I allow it! I read this recently and I loved the simplicity of it. It’s called the Self Principle. S – Sleep: Get at least seven hours and try to wake and go to bed at the same time every day. E – Exercise: Get 30 minutes a day, preferably in the morning or midday to kick-start your metabolism. L – Love: Have feelings of gratitude for everything you have, do and give. F – Food: Make vegetables and lean protein the priority in your diet. Four steps that I’m convinced would make a difference in our lives if we would follow them. I shared them with you because I’m sure there is someone else out there suffering from information overload just like me. This just might be the simple little principle that works for us. 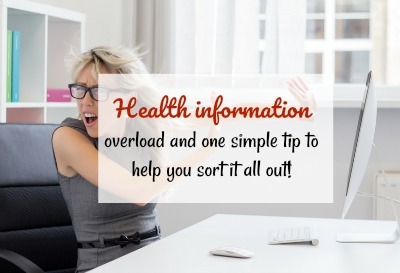 Do you get overwhelmed with information overload? What are the topics that exasperate you the most? Have a wonderful week and remember “SELF”! Thanks for simplifying it! Love the SELF! I’m printing it out and putting in on our fridge. Thank you, Barrie! Simple always works best for me! 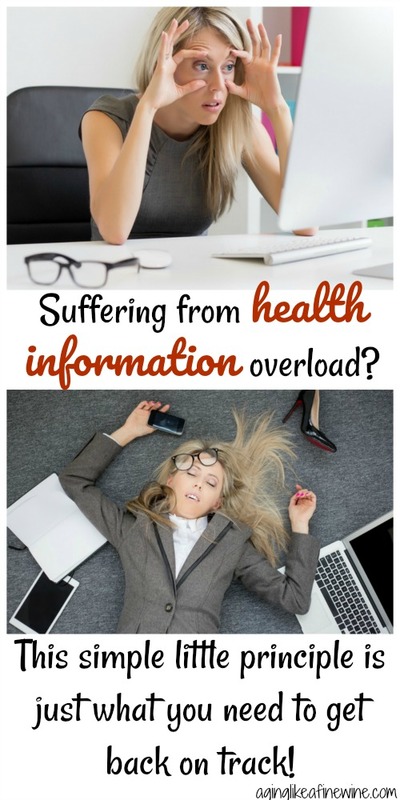 Health-information overload? Check! 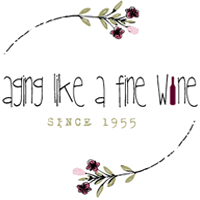 Blog-like-me overload? Double-check! Your post was just what I needed right now! Thank you for sharing this on Sue and Leanne’s new Link Up. I look forward to reading more! Thank you Donna, I’m glad to hear my post was helpful. Loved this Teresa and you are spot on. There is just way too much information around these days and it is so easy to get overwhelmed. I loved your Self Principle points and agree they do make a positive difference to our lives. Thank you so much for sharing and being part of our first Midlife Share the Love party and hope to see you next week. Also, I would love you to be a guest writer for my Over 50 & Thriving series so if you could email me on sue@sizzlingtowardssixty.com.au I can send you the details. Thank you Sue! I would love to be a guest writer on your series and will be sending an email your way. That’s a really useful acronym isn’t it Teresa? I am trying to shed a few Midlife kilos atm and it’s hard work. All those gorgeous, lithe, toned yummy mummies who have all the answers aren’t doing it for me. I’ve gone back to “slow and steady wins the race” as my motivation for the year ahead. Thanks so much for linking up at #MLSTL and I’ve shared this on my social media. Thank you, Leanne. I’ve lost weight the wrong way in the past and I don’t want to make that mistake again because it never lasts. Super simple tips and timely as I’ve become bogged down with So Much Information about health and blogging too! So thank you for the reminder! I loved your Pin, so I’ve pinned that too. I hope they help because, wow, the info out there is mind-boggling! What a great way to keep it simple! Going back to the fundamentals is always the best way to succeed. Thanks Gena! I agree, too extreme never works for long. I too love the simplicity of this, and it is good solid tried and true health information. The absolute basics. Now, if I could only get some good sleep!! Sleep can be a tough one can’t it! I usually don’t have a hard time sleeping, but my husband certainly does. If he wakes up and starts thinking about work, he might as well get up because he’s not going back to sleep. He is retiring this summer so hopefully, his sleep will improve. Thank you! This is a great tip. It is easy to get overwhelmed and discouraged. I will take on this mantra! I hope it works well for you. We can repeat SELF and remind ourselves what each letter stands for! Teresa, YES! I feel that way about so many things and not just health and blogging. I truly wonder what makes these bloggers such experts at the subjects they talk about, especially when a lot of them are just 20 years old. Now I sound like an old fogie. But then, as my daddy said, what choice do I have? I am an old fogie. Hi Nikki, I’m glad you could relate! I’m an old fogie too, but there are an awful lot of us out there and we are important, valuable and have life experiences that give us wisdom that the younger ones don’t have! Yeah for old fogies!! Thank you for your thoughtful comment, Jennifer. My focus now also is not dieting but learning to live a healthy lifestyle. I know intense exercise isn’t going to work for me, but I can make sure I can walk 30 minutes a day. Love the acronym and the simplicity of this sage advice. Thanks for sharing! Simple always works best for me! Thank you for stopping by. Thanks for the simple tips. As you said, we have a tendency to make things way too complicated. Thanks for linking up at #BloggingGrandmothersLinkParty. I enjoy co-hosting with you. Thank you, Christie! I enjoy co-hosting with you and getting to know you also. Those 4 tips are the absolute truth. People make it a lot more complicated than it really is, especially with some of the new diets out there right now! TFS! I agree Amy, and when it gets too complicated, I for one get overwhelmed and give up! This makes absolute sense. Thanks for summing it up and keeping it simple. Thank you! Simple always works best!